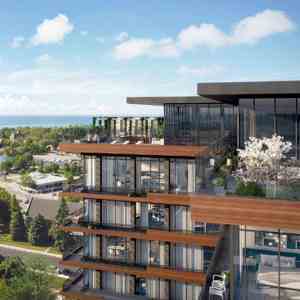 Nola expresses, in architectural detail, the excitement of its waterfront surrounding; it is a tribute to the cool new Port Credit, voiced in design that offers contemporary elegance and luxury. 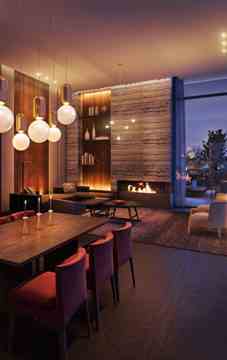 A passionate layering of elements features incremental setbacks articulated to present an elegant and memorable form. Nola’s suites have been carefully designed to provide sweeping views and the ultimate in condominium luxury and function in a setting that is destined to raise the bar for contemporary living. - 9-foot ceilings in living, dining and bedroom(s) except where required bulkheads are installed. 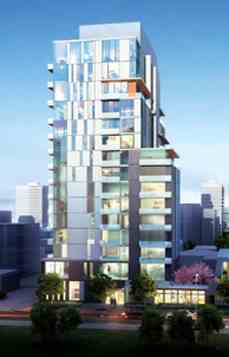 Floors 13, 14 and 15 to feature 10-foot ceilings. - Thermally insulated energy efficient double-glazed windows and sliding doors. - Coordinated schemes professionally designed by Mike Niven Interior Design Inc.
- Pre-finished engineered strip laminate flooring throughout foyer, hallways, living, dining, den, kitchen and bedrooms. - Kitchen cabinets include island and uppers. - Built-in stainless steel microwave and hood fan. - Kitchen island featuring composite quartz countertop with waterfall feature, pots and pans drawers, cabinets and seating area. - Laundry facility featuring full size white stacked washer and dryer, vented to exterior. - Individual service panels with circuit breakers. - Smoke, heat and Carbon Monoxide detectors. - Individual hydro and water metering. Nola is located on the southwest corner of Ann Street and High Street, at the steps of Port Credit Village and the GO Train Station. Slokker in Canada is known for its innovative and leading edge building techniques, its dedication to its customers and clients and its commitment to the social and environmental standards demanded by all those involved in the delivery of quality housing and work space.